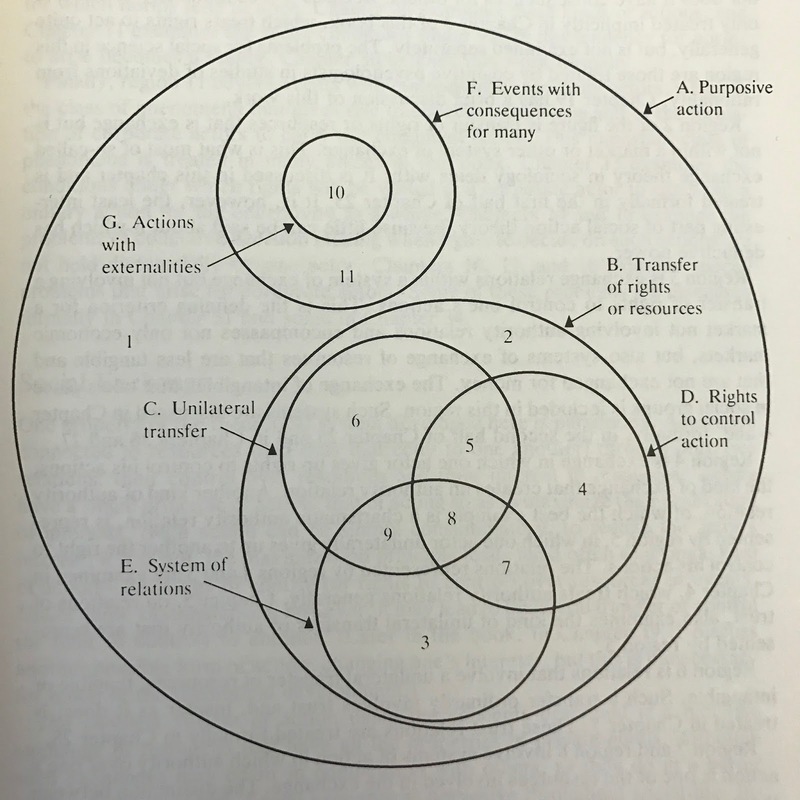 Early in his theoretical treatise of rational-choice sociology Foundations of Social Theory, James Coleman introduces a diagram of different kinds of social action (34). This diagram is valuable because it provides a finely granulated classification of kinds of social action, differentiated by the relationships that each kind stipulates among individuals within the interaction. For example, social events falling in zone 8 have these distinguishing characteristics: they involve a transfer of rights to control action, shifting through unilateral transfer within an existing system of relations. An example might include a party to divorce who surrenders his or her right to control whether the child is moved to another state. This would be a unilateral transfer of control from one party to the other party. Events in zone 7 differ from those in zone 8 only in that they do not reflect unilateral transfer. The same example can be adjusted to a zone 7 case by stipulating that both parties must agree to the transfer of control of the child’s residence. 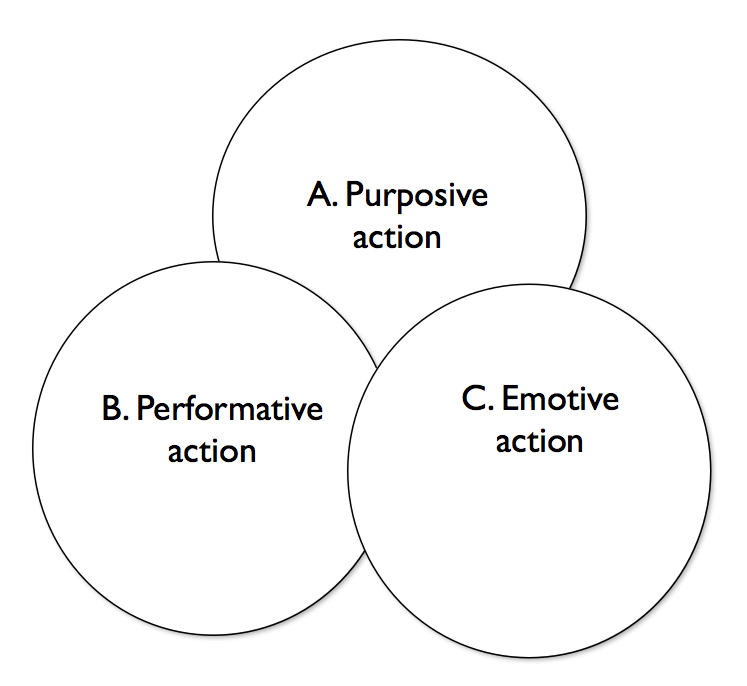 It is interesting to observe that the whole diagram takes place within the domain of purposive action (A). This illustrates Coleman’s fundamental presupposition about the social world: that social outcomes result from purposive, intentional actions by individuals. If we imagined that religious rituals were purely performative, serving as expressions of inner spiritual experience — we would find that these “social events” have no place in this diagram. Likewise, if we thought that there is an important role for emotion, solidarity, hatred, or love in the social world — we would find that actions and phenomena involving these factors would have no place in the diagram. Would this modified scheme give a different orientation to the “sociological imaginary”? Might we imagine that the theories of important intersectional figures like Bourdieu, Tilly, or Foucault might fall in the intersection of all three circles? Would episodes of contentious politics involve actions that are purposive, emotive, and performative? Is there any reason (parsimony, perhaps) to attempt to reduce emotion and performance to a different kind of purpose? Or it is better to honestly recognize the diversity of kinds of action and motivation? My inclination is to think that Coleman’s choice here reflects “rational choice fundamentalism” — the idea that ultimately all human actions are driven by a calculation of consequences. And this assumption seems unjustified. 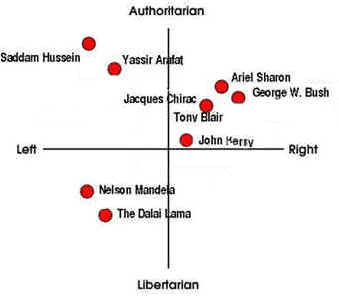 The problem of mapping or classifying people’s political attitudes is more complicated than it looks. Placing people on a spectrum from left to right is convenient but over-simple. 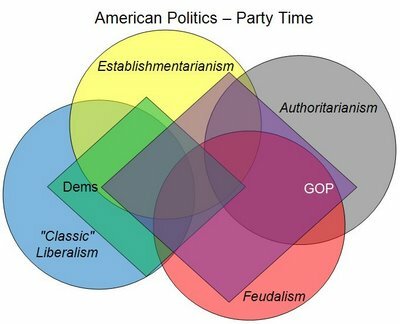 It assumes that there is a single dimension of political difference, ranging from conservative to liberal, and that everyone can be placed somewhere along that spectrum. But social and political attitudes aren’t single-dimensional. So we’d like to have a way of mapping the space of attitudes that captures the separate dimensions that go into political attitudes. Most of the schemes above take a step forward by hypothesizing two dimensions reflecting attitudes towards the involvement of the state in the economy and in individual social and moral life. An economic conservative opposes state involvement in the economy. A social liberal opposes state involvement in individual choices and lifestyle, while a social conservative favors intervention in individual behavior when it comes to certain “social” issues. 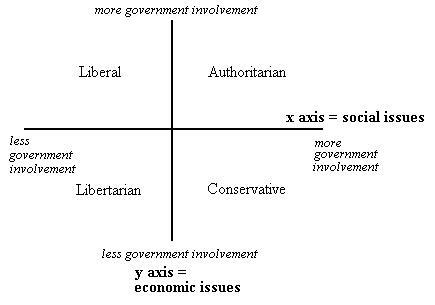 A libertarian opposes both forms of state intervention and an authoritarian supports both. This kind of classification is an improvement, but it doesn’t fully satisfy. It doesn’t really capture the substantive moral ideas that might underlie these attitudes, the political philosophy that might underlie political preferences. A more substantive effort at classification might take the form of a cluster of values shared by various groups. Conservatives favor maintaining traditional values (religion and morality), maintaining an existing system of wealth, power, and prestige (market and social inequality), and limiting the use of state power to these functions. Progressives favor greater social equality and opportunity; they favor the free expression of individual life choices; and they favor using the authority of the state to increase the equality and freedom of ordinary people. Conservatives defend existing inequalities and oppose redistribution. Progressives condemn certain kinds of inequality and justify redistributive measures to redress these inequalities. We might imagine grouping the population into a sort of Venn diagram. Suppose that each circle represents individuals who include the specific issue within his/her top five issues. 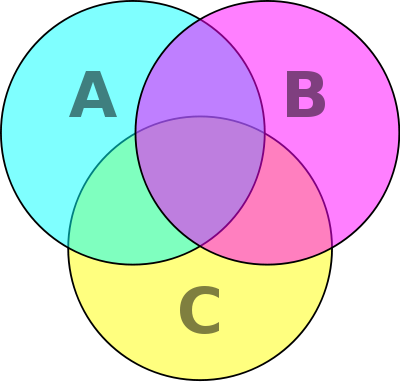 Overlaps indicate the circumstance of individuals who share the issues of each overlapping circle. So region A represents individuals who rank civil liberties, social justice, and environmental issues in their top five; region B represents individuals who rank markets, guns, right to life, and religious fundamentalism in their top five priorities. 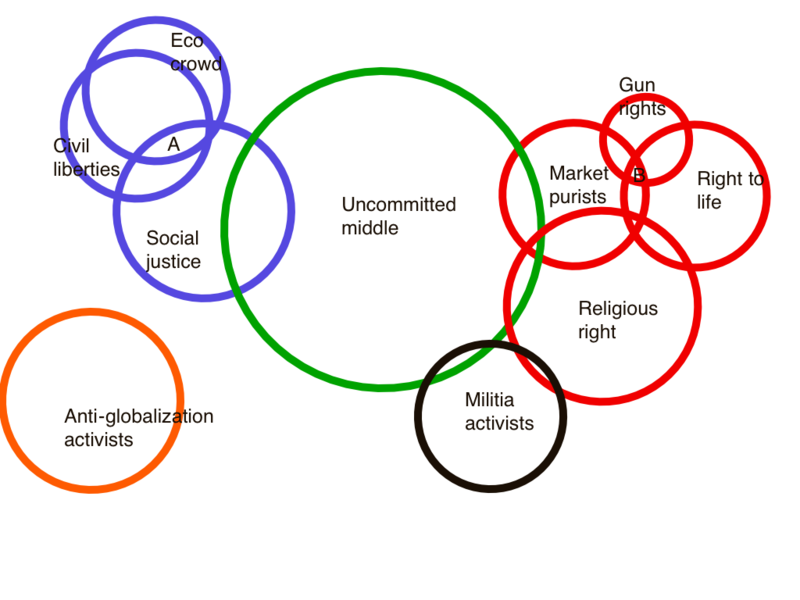 On this diagram, there is no one who is a militia activist and a social justice advocate. Several questions arise here: are there correlations across individuals with respect to these issues? Is there a set of philosophical principles that underlie the choices that individuals make within connected clusters? And do the clusters correspond to identifiable political groups? A while ago I posted on the subject of “disaffected youth“. I don’t have a basis for estimating the percentage of the youth population that falls in this category, but surely it’s a fairly small number in most places. Here I want to focus on the other end of the spectrum — the relatively small but meaningful percentage of young people who have a significant level of “civic engagement” in their blood. You can identify some of these young people in almost every city and suburb in America. They are the high school and college students who feel passionately about community service, civic engagement, and “giving back”. They are involved in activities like alternative spring break, Habitat for Humanity, and the United Way. They are involved in community service in a major way — through mosques, temples, and churches, through social justice organizations such as Amnesty International, Big Brother/Big Sister, and Oxfam, and through organized community service programs at universities and high schools. And they are to be found in a big way in nationally organized programs for community service like AmeriCorps, Teach for America, and CityYear. I’ve met quite a few of these engaged young people over the past ten years, and they are truly inspiring. They are idealistic in a thoroughly practical way. They see the impact they can have through service, and they understand the importance of designing and implementing service programs in the most practical way possible. 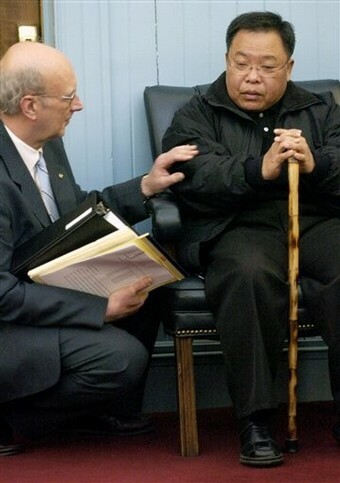 They care about the individual people they help — children, elderly, impaired, impoverished — in very specific human terms. They understand the value of working together in collaboration and teamwork to accomplish great things, and they understand deeply the values and rewards of racial and religious diversity. Finally, they have very little of the crass materialism of “youth America” as it was portrayed on Beverly Hills, 90210 or other examples of this genre. So this group of young people gives a truly optimistic perspective on our society for the future. I don’t take these points to lead to a generalization about American youth as a group. In fact, what is striking is exactly how atypical these young people seem to be relative to the population as a whole — and how similar and compatible they are with each other. But it remains the case — whether 5% or 25%, there is a meaningful minority of today’s generation of young people who give a remarkable level of commitment to social engagement. My question here concerns the social psychology of this group. This is a question about the circumstances of social development that are in place today: where do these young people and their values come from? How has this wonderful mix of optimism, service, and respect for racial differences come about? And how can it be furthered? One thing is immediately clear: it seems to be unrelated to affluence, race, or neighborhood. A cross-section of the CityYear corps is instructive: young people with very similar social values are showing up from middle-class suburbs, impoverished inner cities, and towns that are neither urban nor suburban. And it is easy to find white kids, rich and poor, brown kids, African-American kids, and Asian-American kids — all coming together into a corps of 60-150 young people in a given city. None of these groups seems either more or less concerned about social justice, none seems more readily open to learning from peers from other races, and none seems socially and culturally more ready for a serious commitment to engagement and service. In other words, class, race, and income don’t seem to be critical in defining today’s youth social engagement. A couple of factors are probably highly relevant to the degree of engagement and civic values that is displayed by young people involved in AmeriCorps and CityYear. Second, recruitment certainly plays an important role in explaining this observation about the similarity of corps members from very diverse backgrounds. AmeriCorps and CityYear members are by no means a random sample of the general population. Instead, they are young people who have actively sought out the opportunity for service presented by these organizations, and they have responded favorably to the very explicit expressions of value commitments they represent. Another factor that seems to be operative in generating the value orientation of AmeriCorps and CityYear members is the nature of the training and bonding that occurs within the experience. Young people may come to CityYear with positive attitudes about race relations — but their understanding, commitment, and concrete skills in working in multiracial teams certainly deepens enormously through their year of service. Likewise, what may have been a somewhat thin “will to serve” at the time of recruitment seems typically to deepen into a robust, life-changing involvement in community organizations. The experience of the organization, its leaders, peers, and the service itself leads to a profound deepening of personal engagement. It’s worth dwelling on the causes of youth engagement, because it seems very likely that many of the social problems we will face in the future will only be solved if we can come together as communities of concern, giving our time and our energy to address the serious challenges that are just over the horizon. And these young, engaged people are demonstrating how it can be done. In his pathbreaking 1976 book, The Moral Economy of the Peasant: Rebellion and Subsistence in Southeast Asia , James Scott offers an explanation of popular politics based on the idea of a broadly shared “subsistence ethic” among the underclass people of Vietnam and Malaysia. Earlier postings (hidden transcripts, moral economy) have discussed several aspects of Scott’s contributions. Here I want to focus on the causal argument that Scott offers, linking the subsistence ethic to the occurrence of rebellion. This passage represents a complex explanatory hypothesis about the sources of rebellion. Scott holds, first, that peasant rebels in Indochina in the 1930s shared the main outlines of a sense of justice and exploitation. This is a system of moral values concerning the distribution of material assets between participants (landlord, state, peasant, landless laborer) and the use of power and authority over the peasant. Second, this passage supposes that the values embodied in this sense of justice are motivationally effective: when the landlord or the state enacts policies which seriously offend this sense of justice, the peasant is angered and indignant, and motivated to take action against the offending party. Offense to his sense of justice affects the peasant’s actions. Third, Scott asserts that this individual motivational factor aggregates over the peasantry as a whole to a collective disposition toward resistance and rebellion; that is, sufficient numbers of peasants were motivated by this sense of indignation and anger to engage in overt resistance. On this account, then, the subsistence ethic–its right of a subsistence floor and the expectations of reciprocity which it engenders–is a causal antecedent of rebellion. It is a factor whose presence and characteristics may be empirically investigated and which enhances the likelihood of various social events through identifiable mechanisms. The subsistence ethic may be described quite simply. Scott writes, “we can begin, I believe, with two moral principles that seem firmly embedded in both the social patterns and injunctions of peasant life: the norm of reciprocity and the right to subsistence” (167). Villagers have a moral obligation to participate in traditional practices of reciprocity–labor sharing, contributions to disadvantaged kinsmen or fellow villagers, etc. And village institutions and elites alike have an obligation to respect the right of subsistence of poor villagers. Thus the subsistence ethic functions as a sense of justice–a standard by which peasants evaluate the institutions and persons that constitute their social universe. The subsistence ethic thus constitutes a central component of the normative base which regulates relations among villagers in that it motivates and constrains peasant behavior. And the causal hypothesis is this: Changes in traditional practices and institutions which offend the subsistence ethic will make peasants more likely to resist or rebel. Rebellion is not a simple function of material deprivation, but rather a function of the values and expectations in terms of which the lower class group understands the changes which are imposed upon it. We can identify a fairly complex chain of causal reasoning in Scott’s account. First, the subsistence ethic is a standing condition in peasant society with causal consequences. It is embodied in current moral psychologies of members of the group and in the existing institutions of moral training through which new members are brought to share these values. Through the workings of social psychology this ethic leads individuals to possess certain dispositions to behave. The features and strength of this systems of values are relatively objective facts about a given society. In particular, it is possible to investigate the details of this ethic through a variety of empirical means: interviews with participants, observation of individual behavior, or analysis of the content of the institutions of moral training. Call this ensemble of institutions and current moral psychologies the “embodied social morality” (ESM). 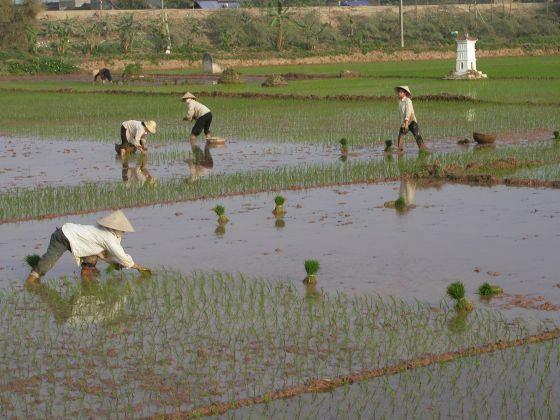 In line with the idea that the subsistence ethic is a standing causal condition, Scott notes that the effectiveness of shared values varies substantially over different types of peasant communities. “The social strength of this ethic . . . varied from village to village and from region to region. It was strongest in areas where traditional village forms were well developed and not shattered by colonialism–Tonkin, Annam, Java, Upper Burma–and weakest in more recently settled pioneer areas like Lower Burma and Cochinchina” (Scott 1976:40). 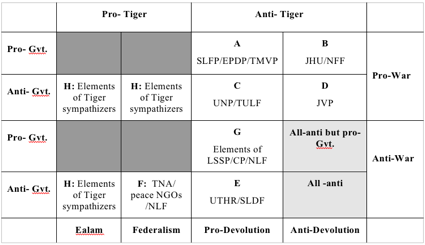 Moreover, these variations led to significant differences in the capacity of affected communities to achieve effective collective resistance. “Communitarian structures not only receive shocks more uniformly but they also have, due to their traditional solidarity, a greater capacity for collective action. . . . Thus, the argument runs, the more communal the village structure, the easier it is for a village to collectively defend its interests” (202). What this account does not highlight — and what is emphasized by several other theories we’ve discussed elsewhere (post, post, post, post) — are the organizational features that underlie successful mobilization. Instead, Scott’s account focuses on the motivational features that permit a group to be rallied to the risky business of rebellion. Earlier posts have addressed aspects of action — particularly the features that align action with purposiveness and choice, deliberation, planning, and improvisation. Here I’d like to focus on the idea of action as a performance — a series of behaviors meaningfully orchestrated by the actor out of consideration of an expected “script”. Here we interpret actions as falling into scripts and roles, created by the culture’s history and constituting the actor’s behaviors as a performance. The agent is postulated to possess a stock of mini-scripts and role expectations that are then invoked into a “syntax” of performance in specific social settings. So there are fairly tangible ways in which the behaviors of the commander and the company are in fact governed by scripts and roles. The dramaturgical interpretation makes sense here. The actions of these participants are not invented de novo on the scene of the fire; rather, they derive from earlier practice of roles and, more intangibly, carrying out of a certain conception of behavior of a commander under stress. We don’t get actions here that derive from unadorned actors, considering a range of choices and choosing the best in the circumstances. But neither do we get the opposite extreme — robots playing out their scripts without intelligence or adaptation to circumstance. Instead, each of the players in this story retains his/her own assessment of what is currently going on and what deviations of script may be demanded. 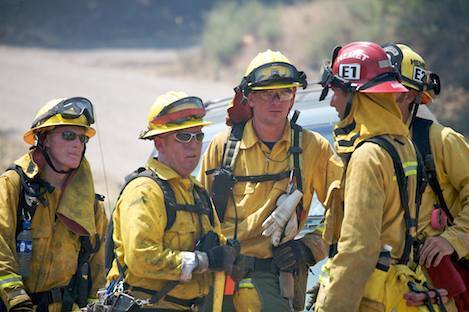 The captain retains the ability and the responsibility to break with procedures when there is an imminent reason to do so; and this degree of autonomy extends down the line of command to the junior firefighter. So the routines and scripts guide rather than generate the behavior. So the performative interpretation of social action is not inherently inconsistent with the idea of intelligent, purposive action. Instead, we can think of the actor in this case — captain or junior firefighter — as involving in a complicated series of behaviors that reflect both deliberation and internalized script. I think this interpretation is very analogous to Pierre Bourdieu’s position on the subject of habitus in Outline of a Theory of Practice . Conduct that is guided by norms (in this case, scripts and roles) can nonetheless also be intelligent and strategic. Seen in this light, the dramaturgical interpretation supplements the purposive theory of action rather than replaces it. The role of norms in social behavior is a key question for sociology. Is a norm a sociological reality? And do individuals behave in conformance to norms? We can offer mundane examples of social norms deriving from a wide range of social situations: norms of politeness, norms of fairness, norms of appropriate dress, norms of behavior in business meetings, norms of gendered behavior, and norms of body language and tone of voice in police work. In each case we suppose that (a) there is a publicly recognized norm governing the specified conduct within a specific social group, (b) the norm influences individual behavior in some way, and (c) sanctions and internal motivations come into the explanation of conformant behavior. Norm-breakers may come in for rough treatment by the people around them — which may induce them to honor the norm in the future. And norm-conformers may do so because they have internalized a set of inhibitions about the proscribed behavior. Here are a number of key empirical and conceptual questions that are raised by norms. How are social norms embodied in behavior and structure? How do individuals internalize norms? How do norms influence behavior? Why do individuals conform their behavior to a set of local norms? What factors stabilize a norm system over time? What social factors influence change in a norm system? a socially embodied and individually perceived imperative that such-and-so an action must be performed in such-and-so a fashion. We can then separate out several other types of questions: First, what induces individuals to conform to the imperative? How do individuals come to have the psychological dispositions to conform to the norm? Second, how is the norm embodied in social relations and behavior? And third, what are the social mechanisms or processes that created the imperative within the given social group? What mechanisms serve to sustain it over time? To the first question, there seem to be only three possible answers — and each is in fact socially and psychologically possible. The imperative may be internalized into the motivational space of the individual, so he/she chooses to act according to the imperative (or is habituated to acting in such a way). There may be an effective and well-know system of sanctions that attach to violations of the norms, so the individual has an incentive to comply. These sanctions may be formal or informal. The sanction may be as benign as being laughed at for wearing a hawaiian shirt to a black tie ball (I’ll never do that again! ), or as severe as being beaten for seeming gay in a cowboy bar. Or, third, there may be benefits from conformance that make conformance a choice that is in the actor’s rational self-interest. (Every time one demonstrates that he/she can choose the right fork for dessert, the likelihood of being invited to another formal dinner increases.) Each of these would make sense of the fact that an individual conforms his/her behavior to the requirements of a norm and helps to answer the question, why do individuals conform to norms? The questions about the social embodiment of a norm are the most difficult. Does the embodiment of a given norm consist simply in the fact that a certain percentage of people in fact behave in accordance with the rule — for whatever reason? Does the norm exist in virtue of the fact that people consciously champion the norm and impose sanctions on violators? Might we imagine that human beings are normative animals and absorb normative systems in the way that we absorb grammatical systems — by observing and inferring about the behavior of others? As for the third cluster of questions about genesis and persistence, there is a range of possibilities here as well. The system may have been designed by one or more deliberate actors. It may have emerged through a fairly random process that is guided by positive social feedback of some sort. 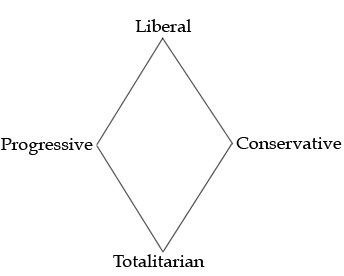 It may be the resultant of multiple groups advocating for one set of norms or another to govern a given situation of conflict and/or cooperation. And, conceivably, it may be the result of something analogous to natural selection across small groups: the groups with a more efficient set of norms may out-perform competing groups. For example, how should we explain the emergence and persistence of a particular set of norms of marriage and reproduction in a given society? Is it causally relevant to observe that “this set of norms results in a rate of fertility that matches the rate of growth of output”? How would this functionally desirable fact play a causal role in the emergence and persistence of this set of norms? Is there any sort of feedback process that we can hypothesize between “norms at time T”, “material results of behavior governed by these norms at T+1”, and “persistence/change of norms at time T+2”? The business practices of a company are consciously adjusted over time to bring about better overall performance; but what about spontaneously occurring sets of social norms? How do these change over time? Do individuals or groups have the ability to deliberately modify the norms that govern their everyday activities? It seems inescapable that norms of behavior exist in a society and that individuals adjust their behavior out of regard for relevant norms. The microfoundations of how this works is obscure, however, in that we don’t really have good answers to the parallel questions: how do individuals internalize norms? And how do informal practices of norm enforcement work? And what social-causal factors play a role in the emergence, persistence, and change of a system of norms at a given time? One of the noteworthy aspects of the framing offered by Victor Nee and Mary Brinton of the assumptions of the new institutionalism is the very close connection they postulate between institutions and norms. (See the prior posting on this subject). So what is the connection between institutions and norms? The idea that an institution is nothing more than a collections of norms, formal and informal, seems incomplete on its face. Institutions also depend on rules, procedures, protocols, sanctions, and habits and practices. These other social behavioral factors perhaps intersect in various ways with the workings of social norms, but they are not reducible to a set of norms. And this is to say that institutions are not reducible to a collection of norms. Consider for example the institutions that embody the patient safety regime in a hospital. What are the constituents of the institutions through which hospitals provide for patient safety? Certainly there are norms, both formal and informal, that are deliberately inculcated and reinforced and that influence the behavior of nurses, pharmacists, technicians, and doctors. But there are also procedures — checklists in operating rooms; training programs — rehearsals of complex crisis activities; routinized behaviors — “always confirm the patient’s birthday before initiating a procedure”; and rules — “physicians must disclose financial relationships with suppliers”. So the institutions defining the management of patient safety are a heterogeneous mix of social factors and processes. A key feature of an institution, then, is the set of procedures and protocols that it embodies. In fact, we might consider a short-hand way of specifying an institution in terms of the set of procedures it specifies for behavior in stereotyped circumstances of crisis, conflict, cooperation, and mundane interactions with stakeholders. Organizations have usually created specific ways of handling typical situations: handling an intoxicated customer in a restaurant, making sure that no “wrong site” surgeries occur in an operating room, handling the flow of emergency supplies into a region when a large disaster occurs. The idea here is that the performance of the organization, and the individuals within it, will be more effective at achieving the desired goals of the organization if plans and procedures have been developed to coordinate actions in the most effective way possible. This is the purpose of an airline pilot’s checklist before takeoff; it forces the pilot to go through a complete procedure that has been developed for the purpose of avoiding mistakes. Spontaneous, improvised action is sometimes unavoidable; but organizations have learned that they are more effective when they thoughtfully develop procedures for handling their high-risk activities. This is the point at which the categories of management oversight and staff training come into play. It is one thing to have designed an effective set of procedures for handling a given complex task; but this achievement is only genuinely effective if agents within the organization in fact follow the procedures and protocols. Training is the umbrella activity that describes the processes through which the organization attempts to achieve a high level of shared knowledge about the organization’s procedures. And management oversight is the umbrella activity that describes the processes of supervision and motivation through which the organization attempts to ensure that its agents follow the procedures and protocols. 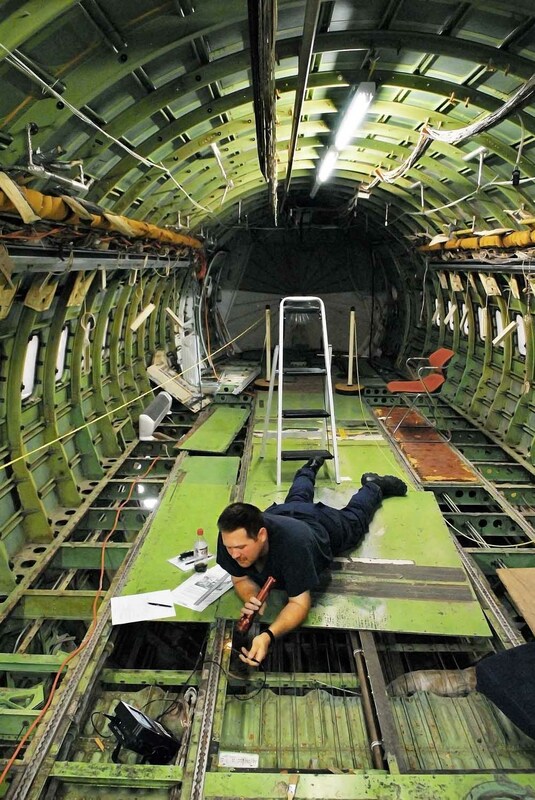 In fact, one of the central findings in the area of safety research is that the specific content of the procedures of an organization that engages in high-risk activities is crucially important to the overall safety performance of the organization. Apparently small differences in procedure can have an important effect on safety. To take a fairly trivial example, the construction of a stylized vocabulary and syntax for air traffic controllers and pilots increases safety by reducing the possibility of ambiguous communications; so two air traffic systems that were identical except with respect to the issue of standardized communications protocols will be expected to have different safety records. Another key finding falls more on the “norms and culture” side of the equation; it is frequently observed that high-risk organizations need to embody a culture of safety that permeates the whole organization. We might postulate that norms come into the story when we get to the point of asking what motivates a person to conform to the prescribed procedure or rule — though there are several other social-behavioral mechanisms that work at this level as well (trained habits, well enforced sanctions, for example). But more fundamentally, the explanatory value of the micro-institutional analysis may come in at the level of the details of the procedures and rules in contrast to other possible embodiments — rather than at the level of the question, what makes these procedures effective in most participants’ conduct? And the distinctive performance characteristics of the institution may derive from the specific nature of the arrangements that are described at each of these levels. Specifying the mechanisms through which institutions shape the parameters of choice is important to an adequate sociological understanding of economic action. These social mechanisms, we argue, involve processes that are built into ongoing social relationships — the domain of network analysis in sociology. Yet, how institutions and networks combine to determine economic and organizational performance is inadequately theorized in the sociological study of economic life. 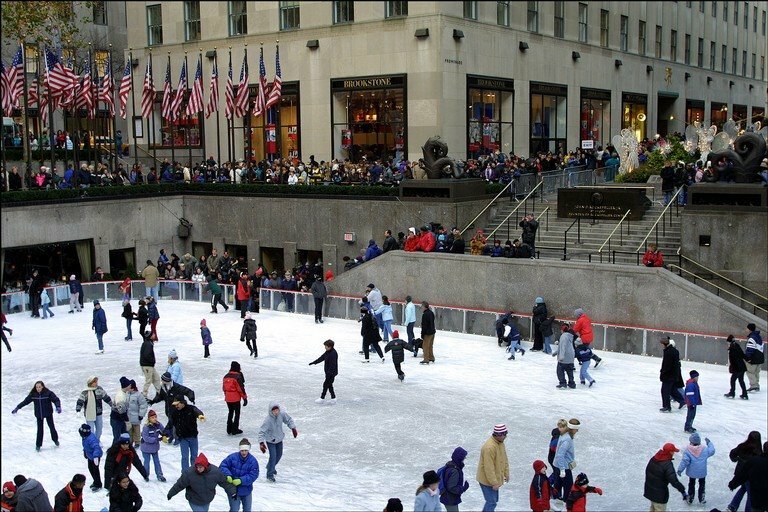 The new institutional economics is essentially a marriage of the familiar assumptions of rational choice theory with the observation that “institutions matter”—that is, that the behavior of purposive individuals depends critically on the institutional constraints within which they act, and the institutional constraints themselves are under-determined by material and economic circumstances. So institutions evolve in response to the strategic actions of a field of actors. The paragraphs quoted above make it clear that the approach stipulates a very tight relationship between institutions and norms regulating behavior. The approach pays close attention to the importance of transaction costs in economic activity (the costs of supervision of a work force, for example, or the cost of collecting information on compliance with a contract). And it postulates that institutions emerge and persist as a solution to specific problems of social coordination. Topics of central concern to the practitioners of the new institutionalism include principal-agent problems (the costs of assuring that one’s agents are performing their functions according to the interests of the principal); the design of alternative systems of property rights; collective action problems; and mechanisms of collective decision-making. In each instance the analysis is designed to illuminate the ways in which institutional arrangements have been selected (or have evolved) in such ways as to respond to an important element of transaction costs. It bears pointing out that this approach does not assume that “optimal” institutions emerge, since the actual institutions selected depend on the distribution of political power across groups and their antecedent interests. This point is richly born out in Robert Bates’s important arguments concerning government agricultural policies in other parts of Africa (Markets and States in Tropical Africa: The Political Basis of Agricultural Policies ) and also in Jack Knight’s efforts to frame the conflictual elements of institutions (Institutions and Social Conflict ). Here is a striking example of a new-institutionalist analysis of a concrete sociological phenomenon: Jean Ensminger’s account of bridewealth in the cattle-herding culture of Kenya (Making a Market: The Institutional Transformation of an African Society ). First, some background. The cattle-herding economic regime of the Orma pastoralists of Kenya underwent substantial changes in the 1970s and 1980s. 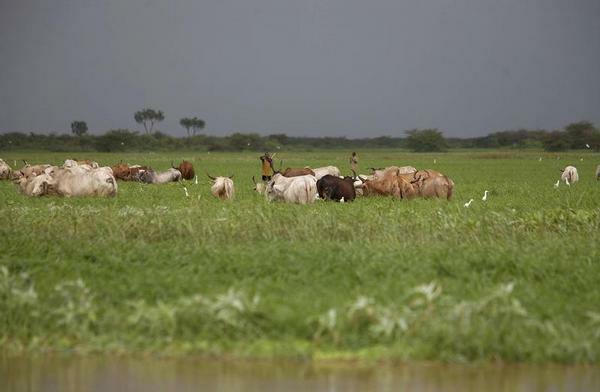 Commons grazing practices began to give way to restricted pasturage; wage labor among herders came to replace familial and patron-client relations; and a whole series of changes in the property system surrounding the cattle economy transpired as well. This is an excellent example for empirical study from a new-institutionalist perspective. What explained the particular configuration of norms and institutions of the earlier period? And what social pressures led to the transition towards a more impersonal relationship between owners and herders? Ensminger examines these questions from the perspective of the new institutionalism. Building on the theoretical frameworks of Douglass North and others, she undertakes to provide an analysis of the workings of traditional Orma cattle-management practices and an explanation of the process of change and dissolution that these practices underwent in the decades following 1960. The book puts forward a combination of close ethnographic detail and sophisticated use of theoretical ideas to explain complex local phenomena. How does the new institutionalism approach help to explain the features of the traditional Orma cattle regime identified by Ensminger’s study? The key institutions in the earlier period are the terms of employment of cattle herders in mobile cattle camps. The traditional employment practice takes the pattern of an embroidered patron-client relation. The cattle owner provides a basic wage contract to the herder (food, clothing, and one head of cattle per year). 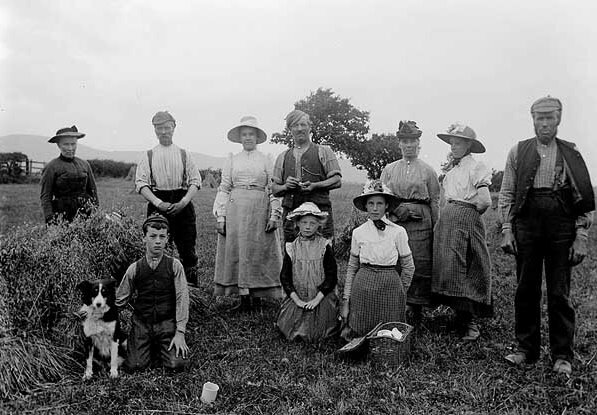 The good herder is treated paternally, with additional “gifts” at the end of the season (additional clothing, an additional animal, and payment of the herder’s bridewealth after years of service). The relation between patron and client is multi-stranded, enduring, and paternal. Ensminger understands this traditional practice as a solution to an obvious principal-agent problem associated with mobile cattle camps. Supervision costs are very high, since the owner does not travel with the camp. The owner must depend on the herder to use his skill and diligence in a variety of difficult circumstances—rescuing stranded cattle, searching out lost animals, and maintaining control of the herd during harsh conditions. There are obvious short-term incentives and opportunities for the herder to cheat the employer—e.g. allowing stranded animals to perish, giving up on searches for lost animals, or even selling animals during times of distress. The patron-client relation gives the herder a long-term incentive to provide high-quality labor, for the quality of work can be assessed at the end of the season by assessment of the health and size of the herd. The patron has an incentive to cheat the client—e.g. by refusing to pay the herder’s bridewealth after years of service. But here the patron’s interest in reputation comes into play: a cattle owner with a reputation for cheating his clients will find it difficult to recruit high-quality herders. This account serves to explain the evolution and persistence of the patron-client relation in cattle-camps on the basis of transaction costs (costs of supervision). 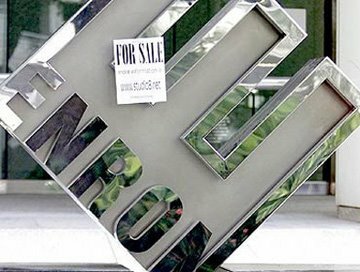 Arrangements will be selected that serve to minimize transaction costs. In the circumstances of traditional cattle-rearing among the Orma the transaction costs of a straight wage-labor system are substantially greater than those associated with a patron-client system. Therefore the patron-client system is selected. This framework would also suggest that if transaction costs change substantially (through improved transportation, for example, or through the creation of fixed grazing areas), that the terms of employment would change as well (in the direction of less costly pure wage-labor contracts). And in fact this is what Ensminger finds among the Orma. When villages begin to establish “restricted grazing areas” in the environs of the village, it is feasible for cattle owners to directly supervise the management of their herds; and in these circumstances Ensminger finds an increase in pure wage labor contracts. New institutionalism is a particularly appealing sociological framework from the point of view of the philosophy of society involved here because it asks the right sorts of questions at the right level. The level of analysis is fairly close to the ground — fairly proximate to the actions of socially embedded agents. And the questions that are posed are key: what social problems is a given set of institutions solving? How do these institutions relate to the purposive actions of individuals? And what are the social mechanisms that stabilize or destabilize a given institutional configuration at a certain point in time? Why do people cooperate? That is, what motivates individuals to come together to share labor and resources in pursuit of a common good from which they cannot be excluded — fighting fires, hunting marauding tigers, cleaning up a public beach? Standard rational choice theory, and its application to problems of individual rationality in group settings, implies that cooperation should be unstable in the face of free-riding. This was Mancur Olson’s central conclusion in his classic book The Logic of Collective Action: Public Goods and the Theory of Groups . Roughly, his conclusion was that cooperation would be possible only if there were excludable side benefits for participants, selective coercion to enforce cooperation, or privatization of the gains of collective action. Otherwise, it is prisoners’ dilemmas all the way down. However, we know from many social contexts that individuals do in fact succeed in establishing cooperative relationships without any of these supporting conditions. So what are we missing when we consider social action from the narrow perspective of rational choice theory? There are, of course, well-known social and behavioral processes that may tend to undermine the working of a given set of norms. Normative systems are inherently ambiguous and subject to revision over time. Consequently we should expect that opportunistic agents will find ways of adapting given social norms more comfortably to the pursuit of self-interest. Consider the requirement that elites should provide for the subsistence needs of the poor in times of dearth. There are some grounds for supposing that such a requirement is in the longterm interest of elites–for example, by promoting social stability and establishing bonds of reciprocity with other members of an interdependent society. But it seems reasonable to expect that elites–already by their superior economic position able to exercise political and social power as well–will find ways of limiting the effect of such norms on their behavior. So it is insufficient to simply postulate a set of governing norms; we need to identify the mechanisms at the group and individual levels that make them behaviorally relevant and stable. But, significantly, some theorists have tried to show that rational self-interest may actually reinforce certain kinds of norms of fairness and reciprocity; thus Robert Axelrod’s analysis of the dynamics of reciprocity demonstrates that cooperation is rational in relation to a variety of circumstances of face-to-face cooperation in The Evolution of Cooperation: Revised Edition . These points notwithstanding, there remains a credible line of criticism of the rational-choice paradigm based on the role of norms in behavior. For it is clear that individuals pay some attention to normative constraints within the process of rational deliberation. The model of simple maximizing decision-making is overly abstract; instead, we need to have a conception of rational action that permits us to incorporate some consideration of normative requirements as well as purposes and goals. We need a broader conception of practical rationality that incorporates both means-end rationality and normative deliberation; we need a theory that embraces both Mill and Aristotle. A number of social scientists have taken this point seriously. Particularly profound is the critique of pure rational choice theory offered by Amartya Sen in an essay called “Rational Fools” (jstor link; and here is the introduction to a recent symposium on the article in Economics and Philosophy). Sen criticizes the assumption of pure self-interest which is contained in the standard conception. Against the assumption of self-interested maximizing decision-making, Sen argues for a proposal for a more structured concept of practical reason: one which permits the decision-maker to take account of commitments. This concept covers a variety of non-welfare features of reasoning, but moral principle (fairness and reciprocity) and altruistic concern for the welfare of others are central among these. Sen believes that the role of commitment is centrally important in the analysis of individuals’ behavior with regard to public goods, and he draws connections between the role of commitment and work motivation. He argues, therefore, that in order to understand different areas of rational behavior it is necessary to consider both utility-maximizing decision-making and rational conduct influenced by commitment; and it is an empirical question whether one factor or the other is predominant in a particular range of behavior. Thus Sen holds that an adequate theory of rationality requires more structure than a simple utility-maximizing model would allow; in particular, it needs to take account of moral norms and commitments. These arguments are telling; the model of narrow economic rationality makes overly restrictive assumptions about the role of norms in rational behavior. Human behavior is the resultant of several different forms of motive–self-interest, fairness, and altruism; and several different types of decision-making processes–maximizing and deliberation. A more adequate model of broadened practical rationality therefore needs to incorporate a decision rule that represents the workings of moral constraints and commitments as well as goal-directed calculation. This rule should reduce to the familiar utility maximizing rule in circumstances in which moral constraints are not prominent — e.g., in decision-making within a market. But in situations where important norms of behavior are in play, we need to try to reproduce the more complex deliberation processes that real human decision-makers undergo in order to combine their normative commitments and their goals and preferences. This broadening of the conception of individual rationality has important implications. For example, consider public goods problems. Once we consider a more complex theory of practical deliberation, formal arguments concerning freeriding problems in real social groups will be indeterminate. On a more complex, and more empirically adequate, account of practical reason, conditional altruism, cooperation, and reciprocity may be deliberatively rational choices; therefore we would expect a social group consisting of rational individuals to show signs of cooperation and conditional altruism. And the challenge for sociology is to identify the mechanisms of individual deliberation and social reinforcement that serve to stabilize the system of norms and the behaviors that conform to them. This is one of the tasks that the field of new institutionalism has taken on (Mary Brinton and Victor Nee, eds., The New Institutionalism in Sociology ). What is the role of trust in ordinary social workings? I would say that a fairly high level of trust is simply mandatory in any social group, from a family to a workplace to a full society. Lacking trust, each agent is forced into a kind of Hobbesian calculation about the behavior of those around him or her, watching for covert strategies in which the other is trying to take advantage of oneself. The cost of self-protection is impossibly high in a zero-trust society. Gated communities don’t help. We would need to have gated and solitary lives. Even our brothers and sisters, spouses, and offspring would have to be watched suspiciously. We would live like Howard Hughes at the end of his life. To begin, what is trust? It is a condition of reliance on the statements, assurances, and basic good behavior of others. The status of commitments over time is essential to trust. We need to consider whether we can trust a neighbor who has promised to return a lawn mower — will he keep his promise? Can we trust the car park attendant not to take the iPod from the glove compartment? Can we trust the phone company to not add hidden fees to our bill in a corporate decision that they won’t be noticed by most consumers? It is sort of a commonplace in moral philosophy that you can’t trust a pure egoist or an act utilitarian. The reason is simple: trust means reliance on the correct behavior of other agents even when there is an opportunity for gain in incorrect behavior and the probability of detection and sanctions is low. The egoist will reason on the basis of the advantage he/she anticipates and will discount the low likelihood of sanction. But likewise, the act utilitarian will add up all the utilities created by “correct action” and “incorrect action”, and will be bound to choose the action with the greater utility. The fact of an existing promise or other obligation will not change the calculation. So the act utilitarian cannot be trusted to honor his promises and obligations, no matter what. Standards of “correct behavior” are difficult to articulate precisely, but here’s a start: telling the truth, keeping promises and assurances when they come into play, acting according to generally shared rules of professional and social ethics, and respecting the rights of others. We sometimes describe people and organizations whose behavior conforms to these sorts of characteristics as possessing “integrity”. So there are two basic models of action that people can choose: consequentialist and “constrained by obligations” (deontological). The first approach is opportunistic and myopic; the other reflects integrity and the validity of long-term obligations. But here we have a problem. The most ordinary social transactions become almost impossible in a no-trust environment. If I can’t trust my bank to hold my savings honestly, or my employer to keep its commitments about my retirement accounts, or the passenger on the seat next to me on a long airplane flight to not go through my briefcase if I drift off to sleep — then I am forced into a condition of exhausting, sleepless vigilance. And, of course, we do generally trust in these circumstances. But it is an interesting problem for research to consider whether different societies and groups elicit and sustain different levels of trust in ordinary life, and what the institutional factors are that affect this outcome. Is there a higher level of trust in Bloomington, Illinois than Chicago or Houston? Is trust a feature of the learning environment through which people gain their social psychologies? Are there institutional features that encourage or discourage dispositions towards trust? And what are the compensating mechanisms through which social interactions proceed in a low-trust environment? Is that where “trust but verify” comes in?